CATHERINE CAMPBELL GAVE birth to her son, John Thomas, in the early hours of 18 February 2003. He was a full-term baby, delivered naturally in the Rotunda Hospital, and weighed in at 3.3kg. Within moments of his arrival, she was shown a “lemon shaped lesion on his lower back”. Within hours, John Thomas was in Temple Street Children’s Hospital with his dad Michael. “It was the longest, loneliest day of my life despite me being surrounded by a myriad of medics who all told me to get some rest,” recalls Catherine. Children with Spina Bifida have varying levels of difficulties, depending on the where the spinal lesion is located and possible other complicating factors. Problems can include paralysis, hydrocephalus, obesity, orthopaedic complications, osteoporosis, renal issues, incontinence, visual difficulties, intellectual disability or cognitive difficulties and sexual dysfunction. 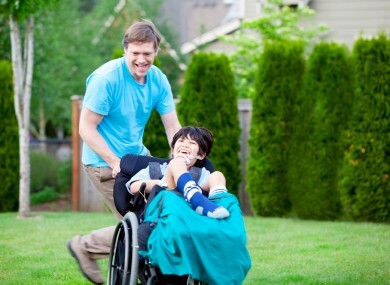 The most severely affected children can be completely dependent on others for care with many being wheelchair dependent, incontinent and presenting with intellectual difficulties. Catherine was released from hospital after two days but John stayed in Temple Street for three weeks. During the second week, he underwent surgery to insert a shunt from the base of his brain and drain excess fluid via his stomach. It was with “trepidation, anxiety and fear” that Catherine and Michael brought John home, where his older sister Anna (then two years old) also lived. The fears and anxieties lessened as the days passed, particularly with the help of the Central Remedial Clinic and other services. Hometime routines are now mostly untroubled, with John getting up and dressing with assistance. To promote his independence, we’re trying to cut back and encourage him to do more himself. But when you’re under pressure and to be out for a certain time, you end up taking on more. However, as John enters Sixth Class, his mother still looks for a better way to ensure he is getting the best possible care. “It would be great to have a one-stop-shop,” she tells TheJournal.ie on being asked for her ‘wish list’ for John’s formal healthcare. A clinic that all children could access with professionals together. Rather than three appointments in Dublin in one week in different places. Currently, the Louth-based family must travel to various appointments in Meath, Louth and Dublin. There is a clinic in Temple Street but it’s still not as comprehensive as either the doctors or patients would like. Most importantly, it lacks in paediatric urology, a major issue for those living with Spina Bifida. Dr Jane Leonard, consultant paediatrician and lead on Spina Bifida Service at Temple Street, agrees. “When you think about it from an emotional and self-esteem perspective, it is these issues that are difficult to come to terms with as a young adult,” she says. It can lead people to be shy or withdrawn, maybe lacking in confidence. We need to sort as much as possible for the things that can be improved. They have a disability but we can optimise the quality of life because of their abilities. That quality of life can also be helped by attending mainstream school. But this is only possible with an adequate amount of help through classroom assistants. “It would have been a much harder battle and I’m not sure if it would be successful if I didn’t have an SNA,” says Catherine. Homework for John is an arduous task that can take up to three hours per evening, which eats into his recreational time. But he does excel at sports. “Wheelchair basketball, football, whatever is available really,” adds Catherine. Horse riding is also used for therapeutic reasons. “He is a very sociable child but can’t take part in regular sports. That doesn’t mean he has no interest. He will attend matches and sit on the sideline. He finds the going tough but never wants to be seen or treated differently. He loves football and like any other 11 year old dreams of becoming a pro-footballer. It will be great when there is more emphasis on Paralympians and, maybe, a Centre of Excellence for Sport, she muses. The ‘wish list’ is a long way off though. “If we look back in time yes we can say improvements have come but there is a massive leap needed to enable our children access a whole raft of services, mostly in health and educational sector when they need it, not when it is too late and an opportunity is missed,” continues Catherine. “A child of any age who has a disability requires a lot more time. It may be just simple daily tasks that you and I take for granted or it may be that an hour each day is put aside for exercises, usually home-work will be slower and there are many more examples. “Meanwhile cuts in social welfare benefits, along with numerous new taxes and levies we all pay, leave many families really struggling. “There is huge financial pressure attached to having a child with a disability as in most instances one of the parents may have to give up working outside the home in order to become a child’s full time carer or usually reduce hours at the very least. Catherine has called on elected representatives to treat all children equally, which would lead to a better future for John. John is one of about 500 children in Ireland with Spina Bifida. Because access to services varies widely, depending on where in the country families live, a research project was undertaken by Temple Street. The results, due out tomorrow, will identify the health needs of the children. Dr Leonard has submitted a business case to the HSE to grow the multi-disciplinary team at Temple Street, to create that one-stop shop. “There are efficiencies to be had down the line,” she explains. “If you get in early, you will avoid obesity and renal failure. Getting it early then avoids that which is hugely costly later on in life. Open thread: What’s your experience with hospital overcrowding? Email “'The day my son was born was the longest, loneliest day of my life'”. Feedback on “'The day my son was born was the longest, loneliest day of my life'”.